Beat the pudding mix and milk in a large bowl with a whisk for 2 minutes. Cover and refrigerate for 20 minutes. Spoon 1 tablespoon fudge topping into each pastry shell. Reserve 6 slices banana. Divide the remaining banana among the pastry shells. Spoon the pudding mixture into the pastry shells. 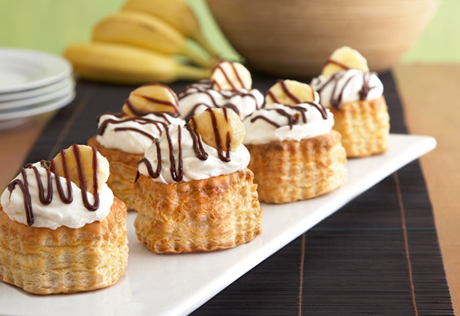 Top each with 1/4 cup whipped cream and 1 slice reserved banana. The pastry shells can be prepared up to 4 hours ahead and kept at room temperature. The pudding mixture can be prepared up to 48 hours ahead and kept covered and refrigerated. For a finishing touch, you can drizzle additional warm hot fudge topping over the filled pastries or sprinkle with unsweetened cocoa powder.